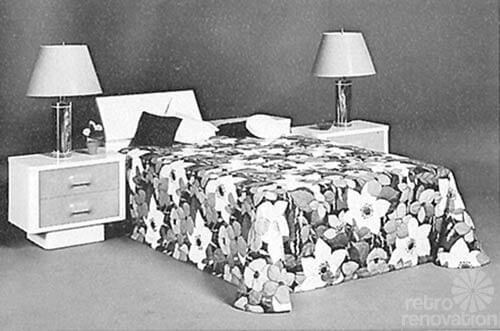 Pam is truly madly deeply in love with the mid mod mad flower power Broyhill Premier Chapter One furniture line — so much so that our 2013 Retro Renovation Color of the Year is named after the “ecstatically colorful” Broyhill flower power green… We also have been building a growing photo archive of all the pieces. 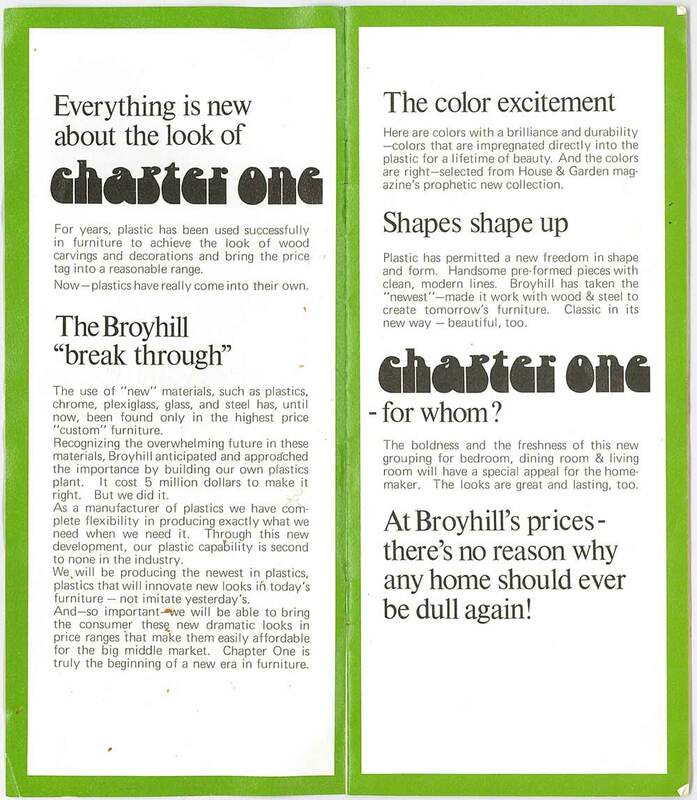 So you can bet, that when reader Rose found us, and offered to scan and send her original Broyhill Premier Chapter One catalog, we hop skipped and jumped at the chance. And now: 24delicious pages, capturing every piece in this line once and for all. I have the a bedroom set of the Broyhill Chapter One. 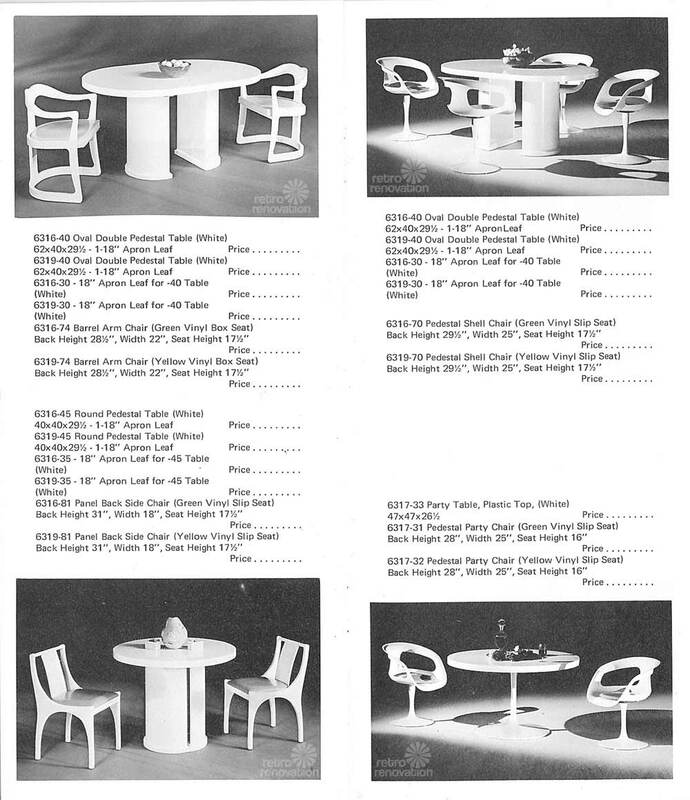 I also have a sales catalog and info from when my father bought the furniture. It was bought in a small town in PA. I had to have it. They had a few pieces. We wanted more and I remember looking all over for it- from New Jersey to VA. We ordered bookcases and it took a very long time to come. 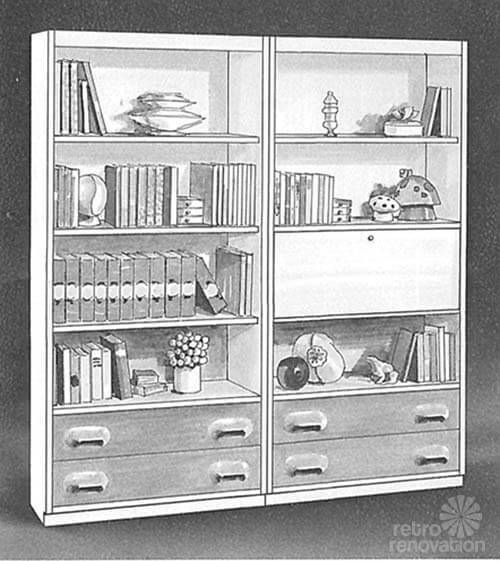 I see in the info it does not have a picture of the bookcases. I have never seen the bookcases anywhere else. 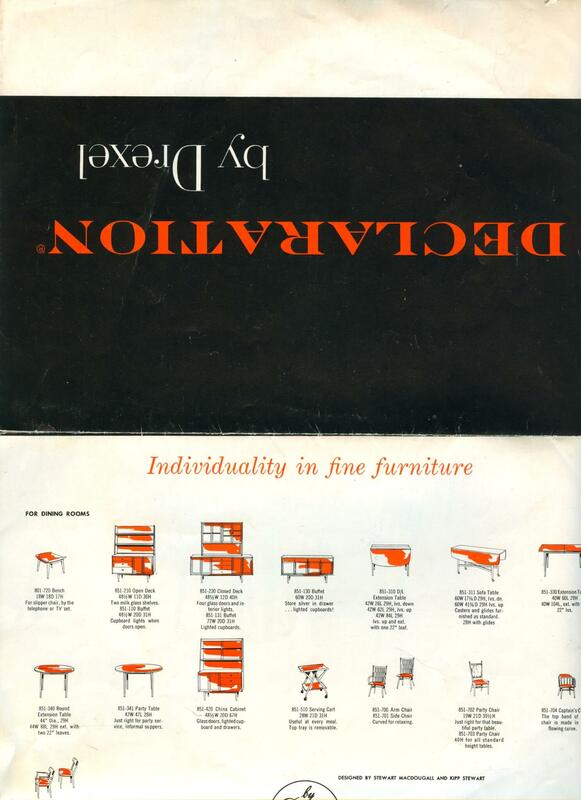 The furniture is well made. We have moved several times and it is heavy. It has been in use since I bought it in 1971. Thank you, Rose! 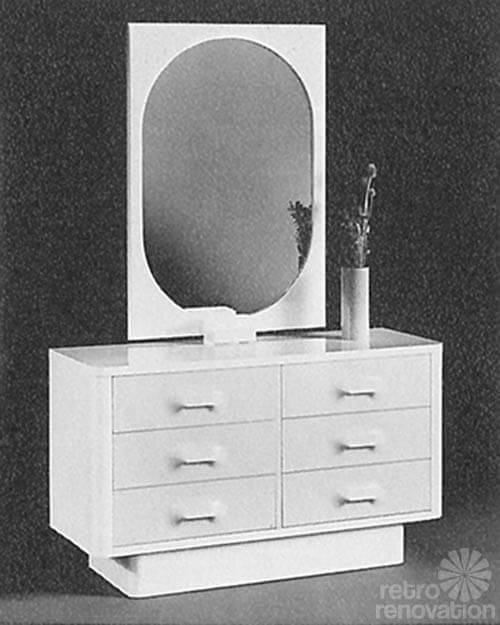 So cool that you have kept this furniture all this time! 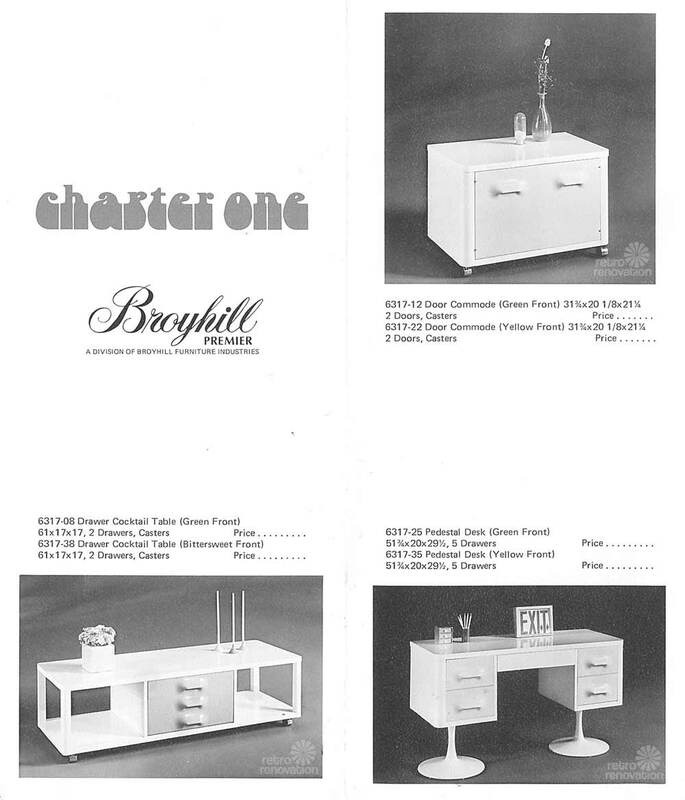 CHAPTER ONE is the beginning of a new era in furniture design and technology. 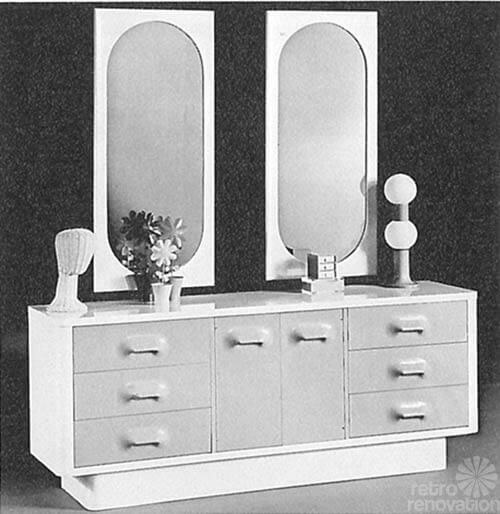 It emphasizes the use of new materials, new shapes and new finish concepts. 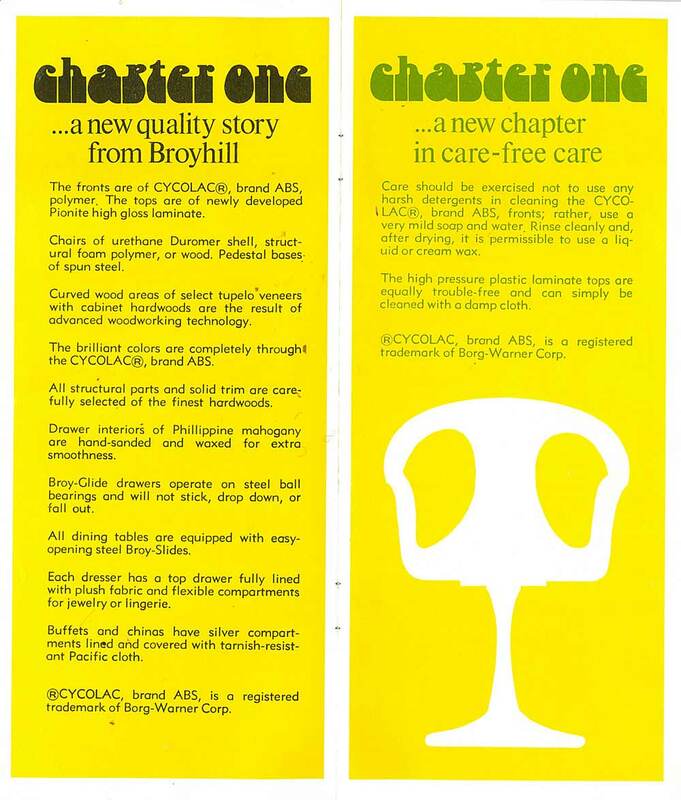 CHAPTER ONE uses plastic for design as well as durability. 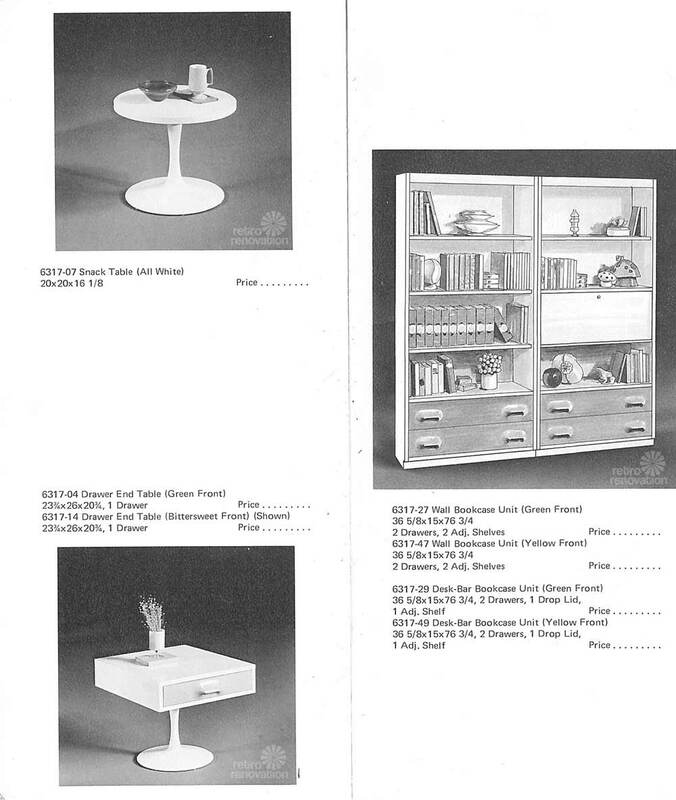 The fronts are of “Cycolac” polymer, the tops are of newly developed Pionite high gloss laminate, chairs of fiberglass shell or structural foam polymer, pedestal bases of spun steel. 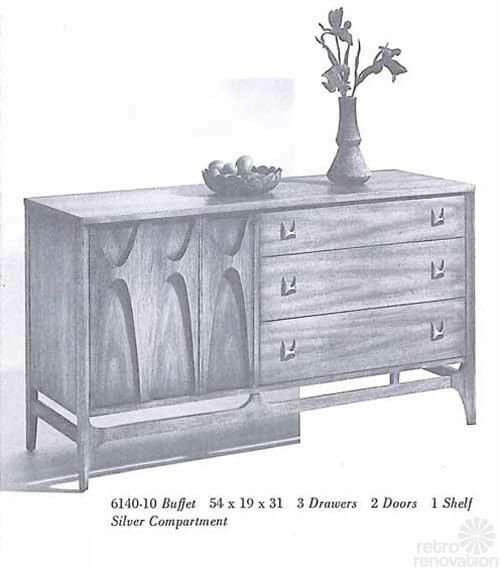 Curved wood areas of select tupelo veneers with cabinet hardwoods are the result of advanced woodworking technology. 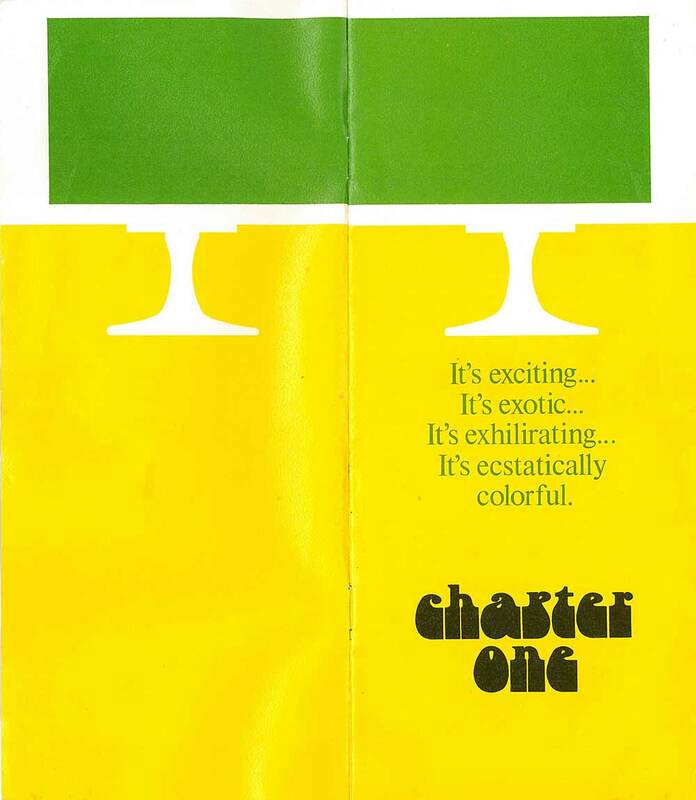 The bright lacquer finish was especially blended for CHAPTER ONE. The House & Garden colors are impregnated into the plastic so that the brilliant colors are completely through the Cycolac®. All this, plus the outstanding Premier features that are standard in CHAPTER ONE, make it one of the most outstanding funiture values in today’s modern market. 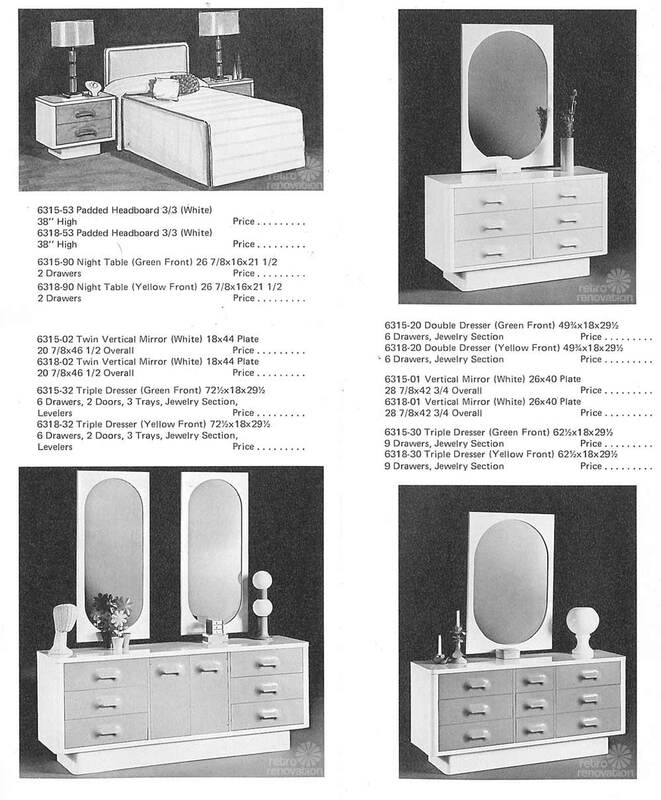 The catalog is of course full of eye candy — but also contains some interesting information about the makeup and care of these pieces. 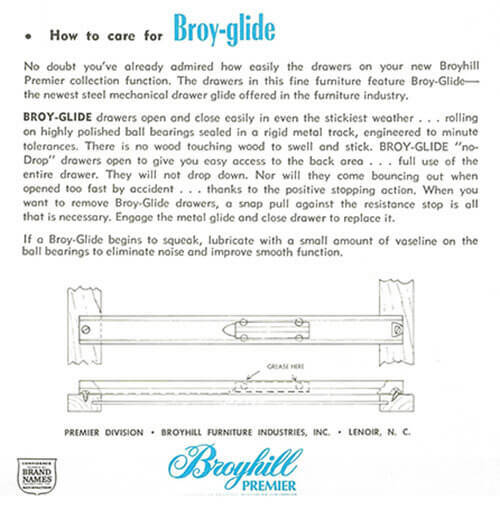 Above — notice the new Broy-glide drawer tracks that roll smoothly on ball bearings in all types of weather, no matter how sticky and also include stops to keep drawers from falling out when opened too quickly. 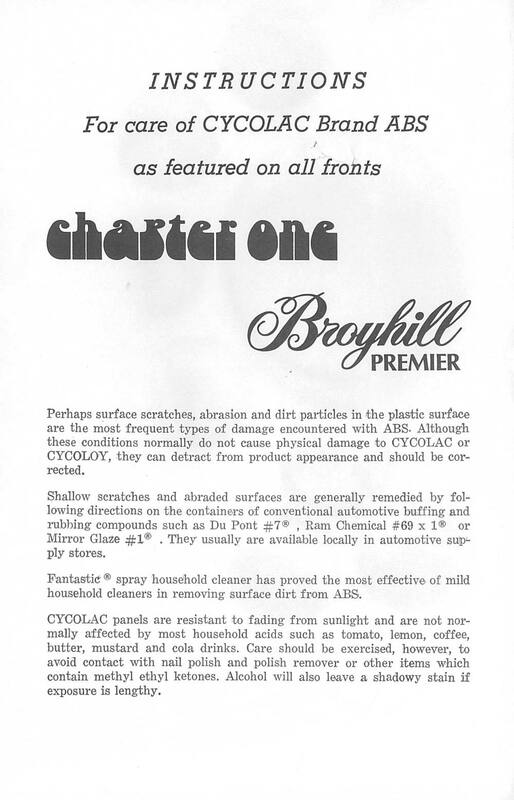 Another interesting tidbit of information in the catalog is the page about Cycolac brand ABS — the new material used to make the brightly colored fronts for this line. 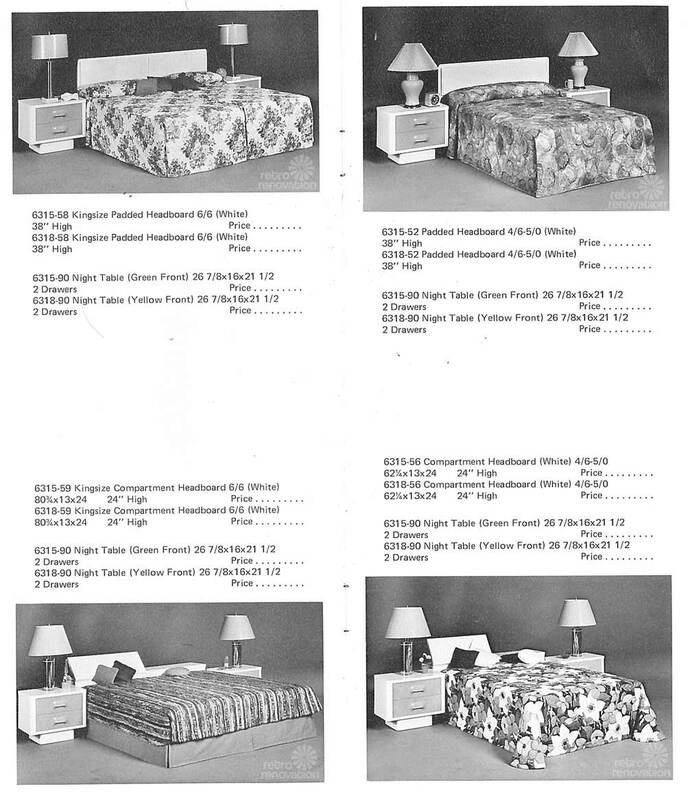 The catalog touts the benefits of plastic laminate furniture saying that it is tough but should be treated with respect to ensure its lasting beauty. 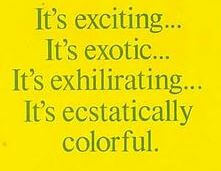 We think it’s spelled “exhilarating”, though. 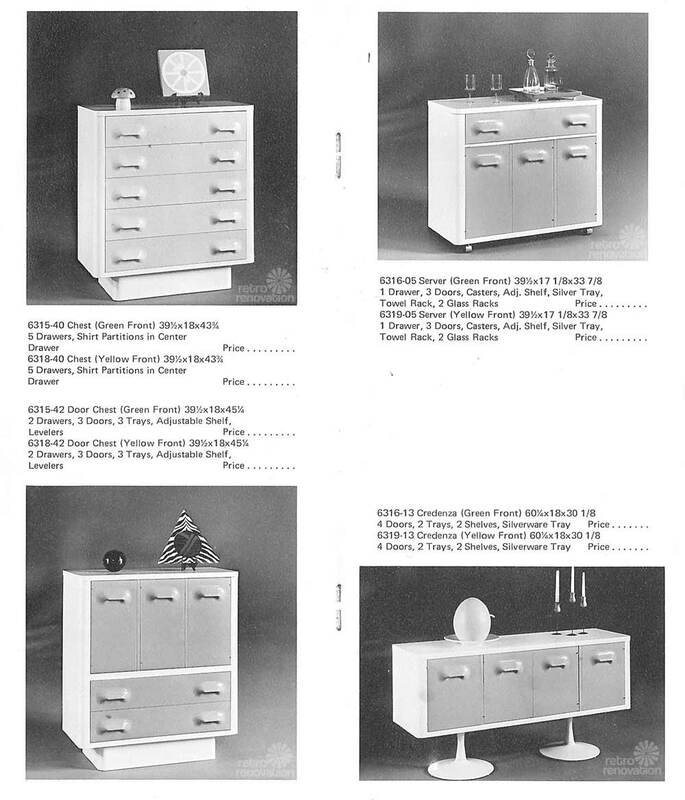 This catalog is packed with photos and illustrations of the often hard to locate line — all of them staged with cheery and unique 1970s decor. 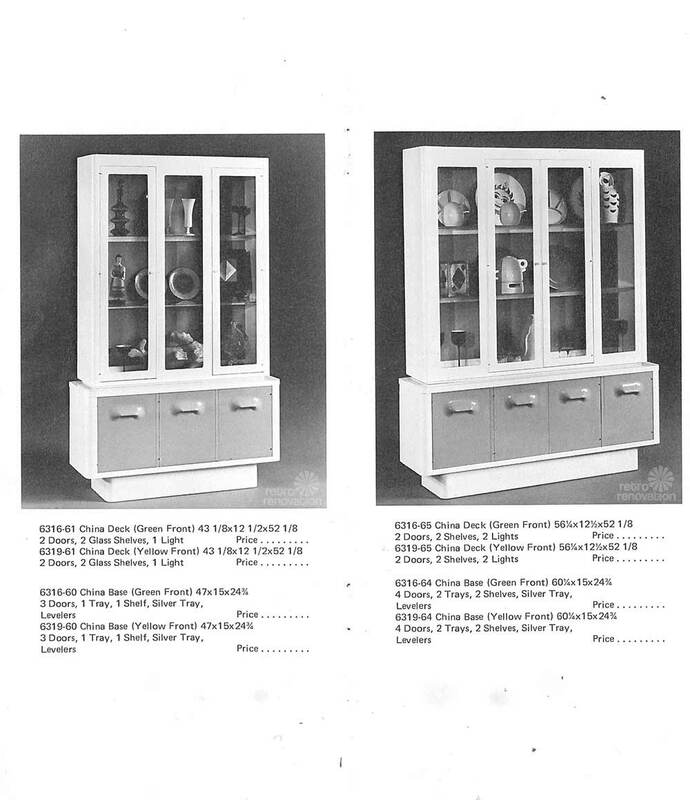 Check out the groovy contents of this large china cabinet above. The bookcases in this line are rare indeed — Rose says she has them, and yes, we’ve never seen any others in the wild. 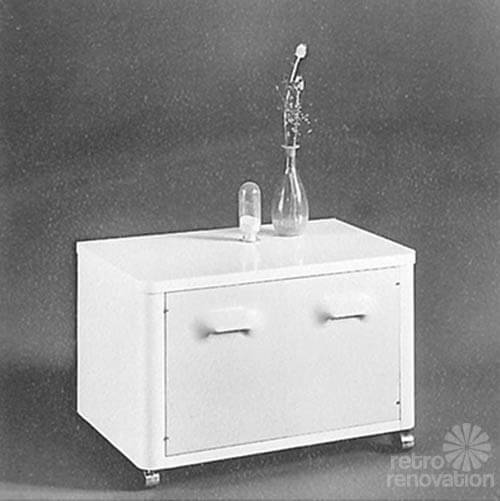 Above: According to the catalog, this rolling server comes with an adjustable shelf, silver tray, towel rack and two glass racks inside. 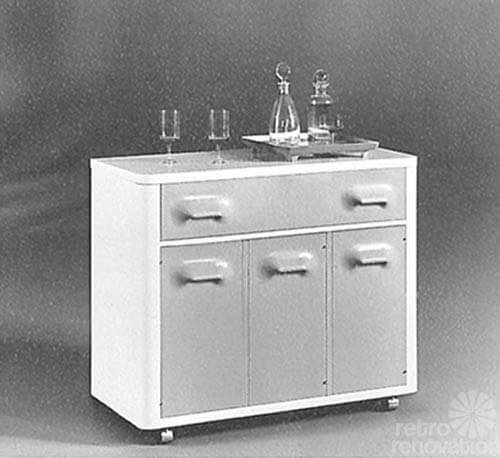 Above: Most of the line comes in either green or yellow — but this rolling cocktail table with drawers comes in green or bittersweet. Rose says she has it in the Bittersweet — which she calls a reddish color. 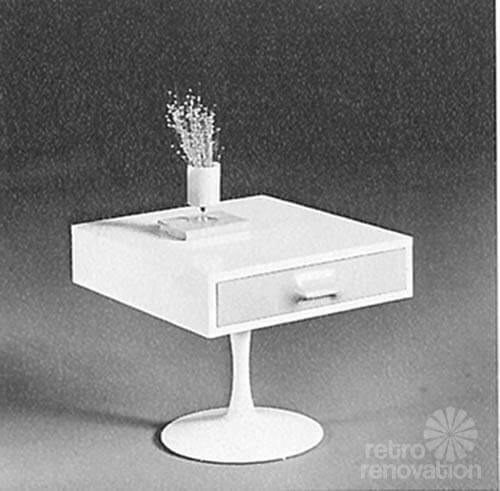 Above: This drawer end table is also available in green and bittersweet. I wonder why only two items in the line had this color option? 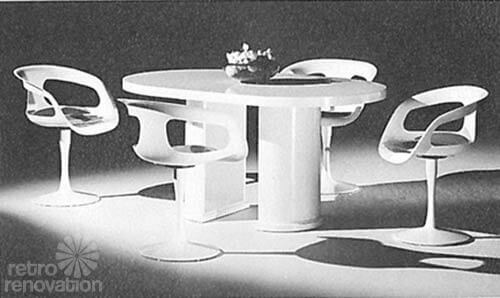 Above: The party table and party pedestal chairs are reminiscent of the famous Saarinen tulip table and chairs, with a 1970s twist. 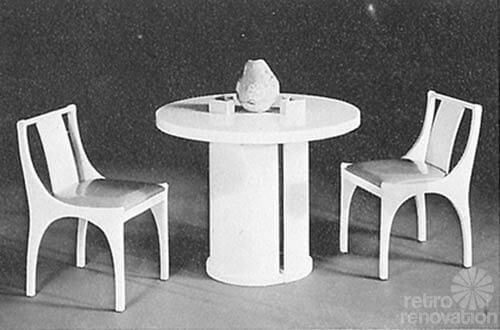 Above: The round pedestal table and panel back chairs are just one variation for a dining set from this line. 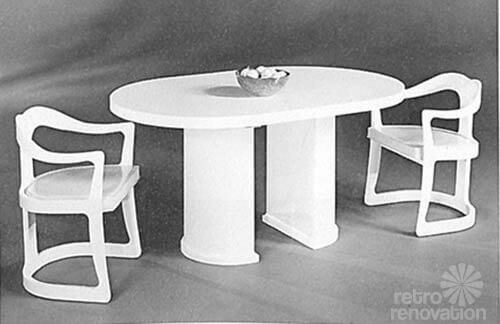 Above: Another variation is the oval pedestal table with the pedestal shell chairs — better for seating a bigger group. 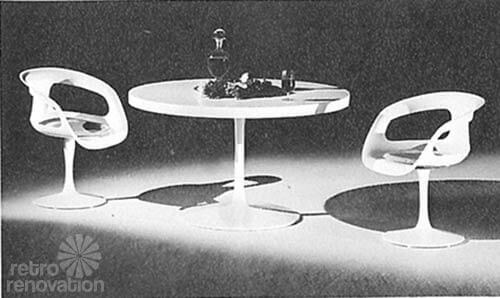 Above: Probably the most unusual looking set from the line — the barrel arm chair is shown above with the oval double pedestal table. 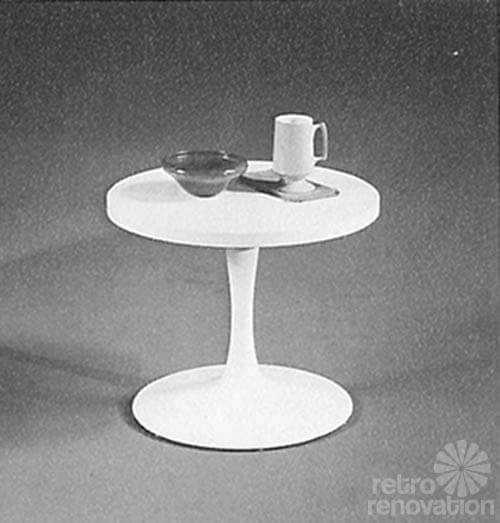 Above: Called the snack table — this little guy must be related to Saarinen’s tulip tables too. 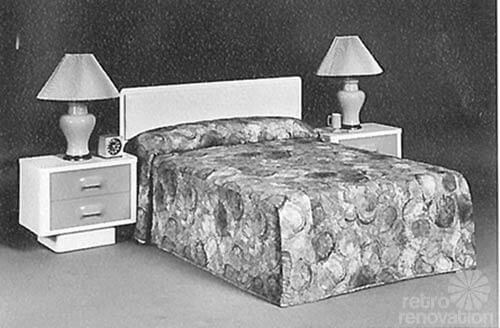 For the bedroom, there are two headboard choices — the first of which is the padded headboard above. Update: We spotted a padded headboard in the wild — we bet it’s pretty rare! — and it’s now in our photo archive. 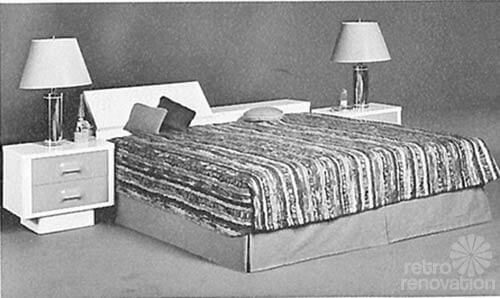 Above: The padded headboard comes in king siz,e too. 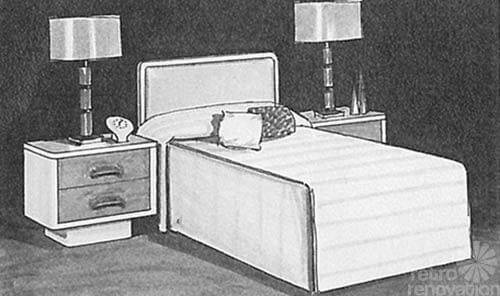 Above: Padded headboard shown in twin size with two drawer nightstands on either side. 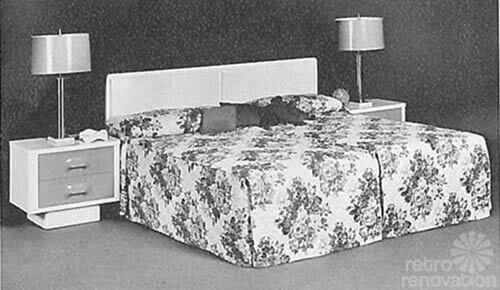 The other headboard choice is the compartment headboard — oddly only available in king and queen/full — no twin size listed for this model. 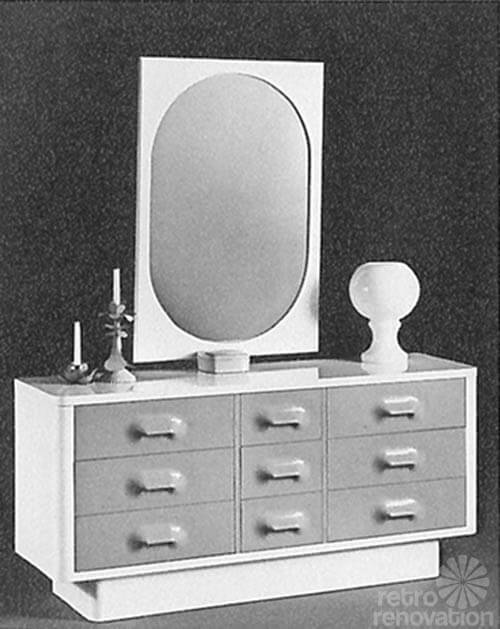 There are a few different options for bedroom dressers as well — above — the double dresser. 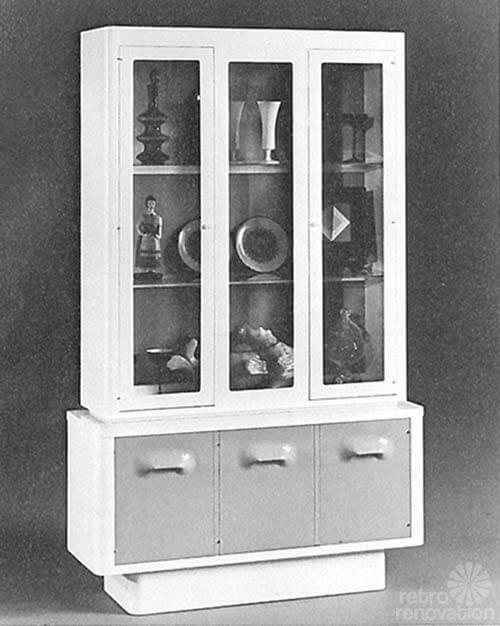 There are two options for a triple dresser — one with drawers shown above and the other has 2 doors as shown below. 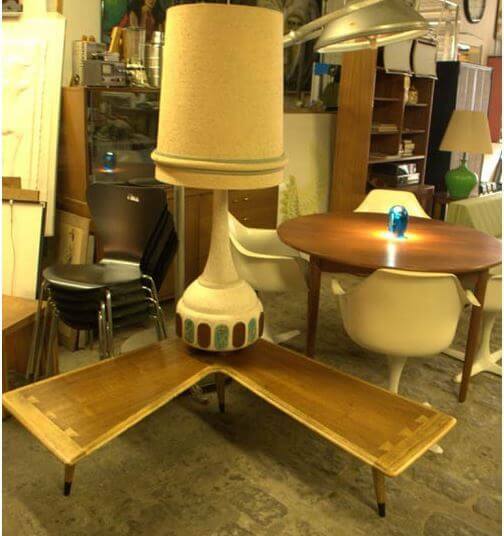 Don’t you love the double decker ball lamp and wicker head used to stage this dresser? 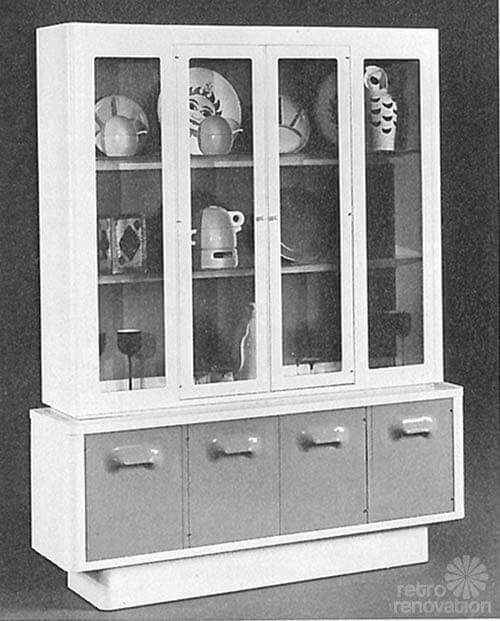 Above: Tall dressers come in two configurations — above — the five drawer. 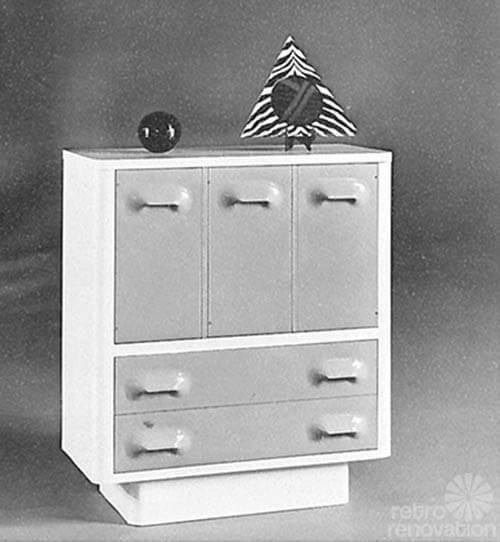 Above: Two drawer, three door chest. 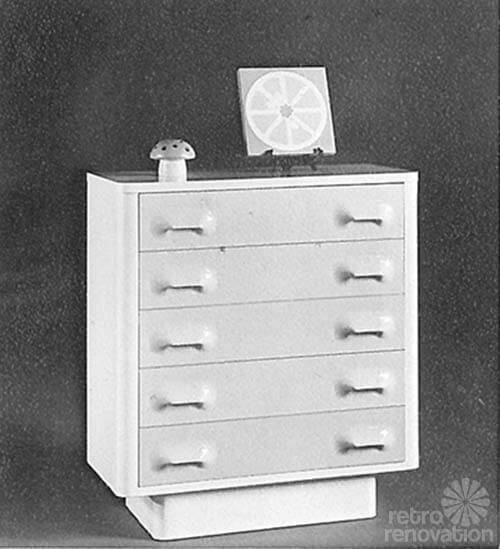 Above: This door commode is grouped with the office furniture in the catalog — and is probably meant to be used for rolling storage. 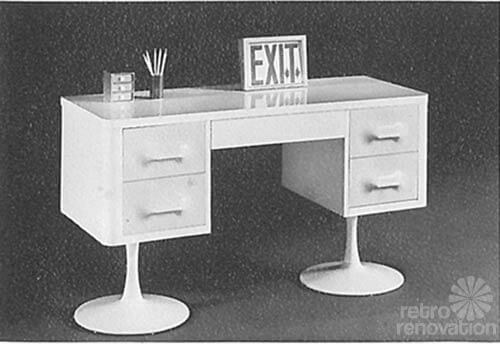 Above: My favorite piece from the line — the pedestal desk. I’ll take mine in yellow please, and throw in that fun EXIT sign for good measure — okay? 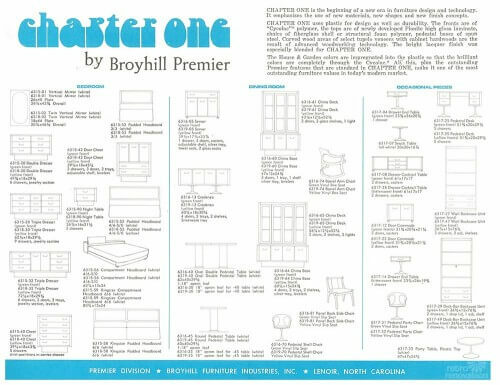 Mega thanks to reader Rose for taking the time to scan and send us her awesome Broyhill Premiere Chapter One catalog so that we could all enjoy it. To see the whole catalog, see our slideshow below. 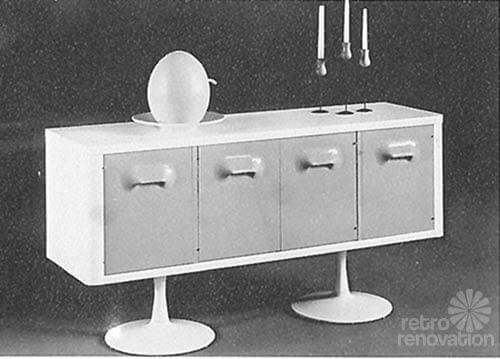 And — be sure to see our growing archive of pieces of this far-out furniture line spotted in the wild. 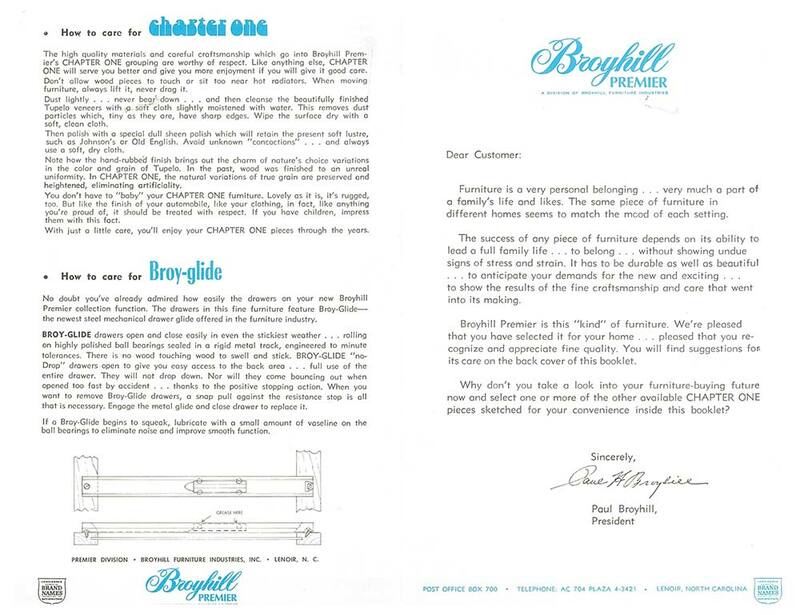 Broyhill was well made because it was made in the USA (until the late 1990s when it moved to China). 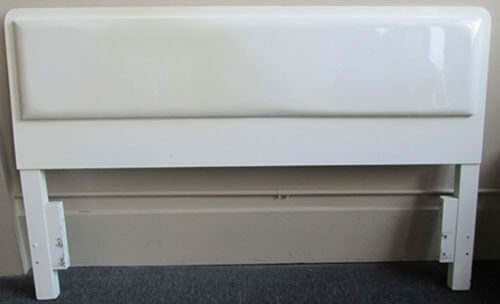 The polymer laminate is a two stage finish (very durable and non-streaky). They don’t take the time to produce high quality two stage finishes in China these days. If you want high quality and made in the USA (every item in my house is vintage made in the USA) then buy vintage! I like the groovy Chapter One font too! have the desk in yellow, the two nightands and a chest in green, love it! 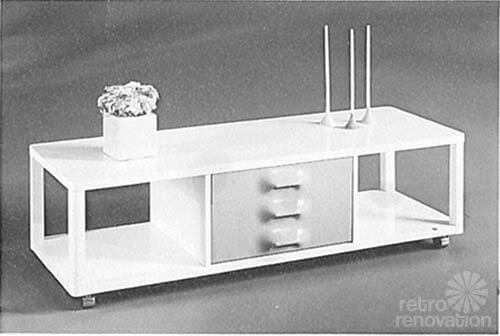 just purchased the orange coffee table and the two nighstands that were shown here! Love them! I have the desk, dresser with mirror, one side table with casters and bookshelf all in yellow for sale right now!